← 27. 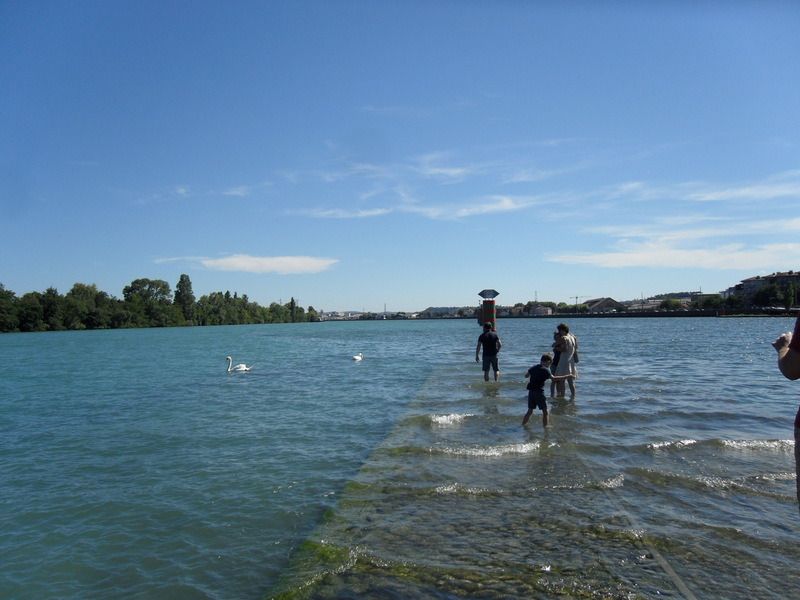 The Saone to The Rhone via UK and Salzburg! 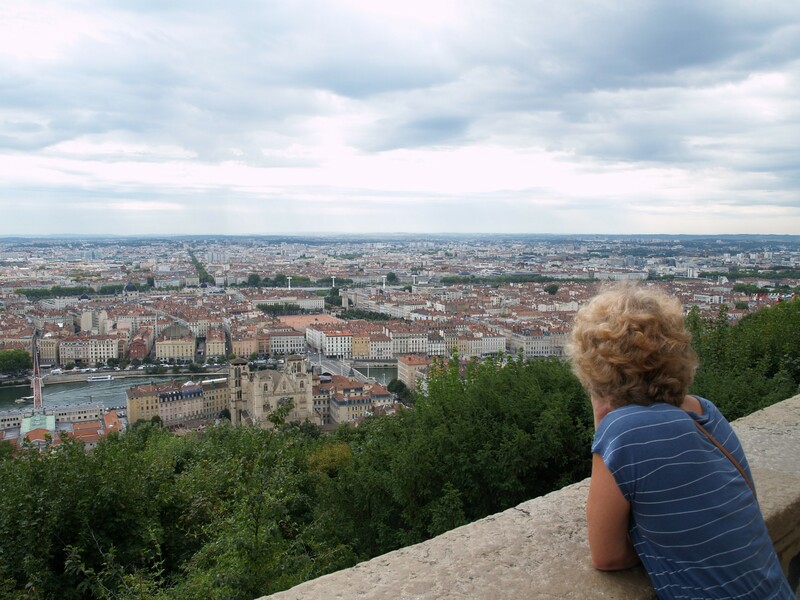 Our stay in Lyon was brief, just a couple of days. Once we found the part of the mooring which was sill free, we settled in to our shady spot. Well it was shady in the morning, but the afternoon sunshine was a bit too hot. 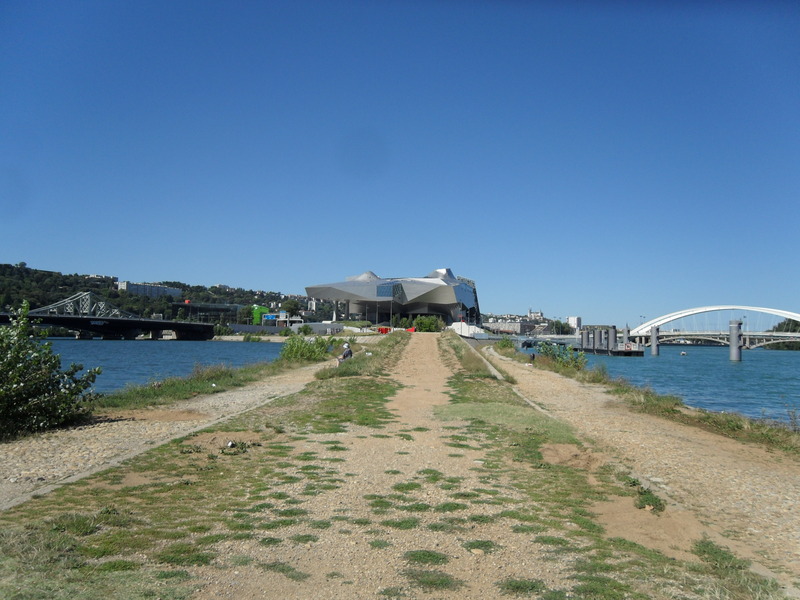 I walked along the Saone to the Confluence with the Rhone; past the unusual arty buildings and newish port which is adjacent to a retail development and only really caters for cruisers. 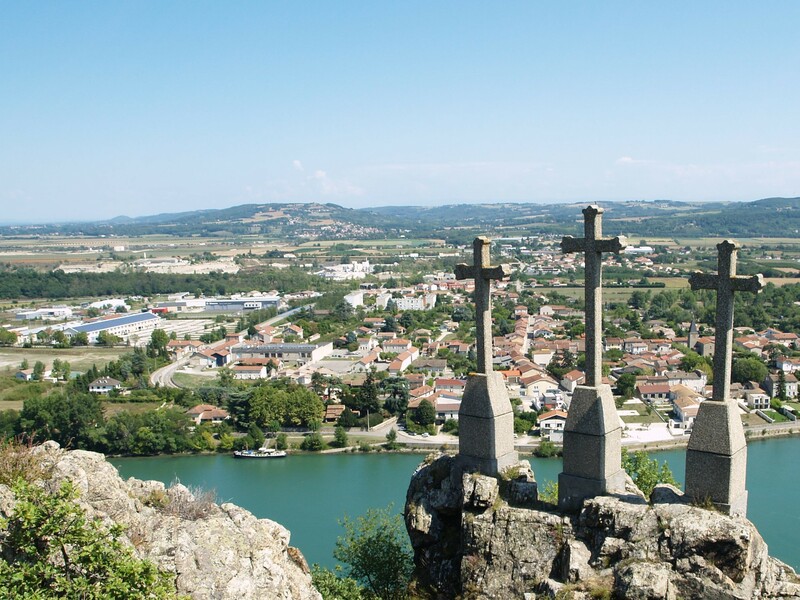 The Rhone side is rather tatty and under developed and the dual carriageway a nightmare if you are on foot, but work is in progress and it can only get better. Looking back towards Lyon, Rhone on the right. 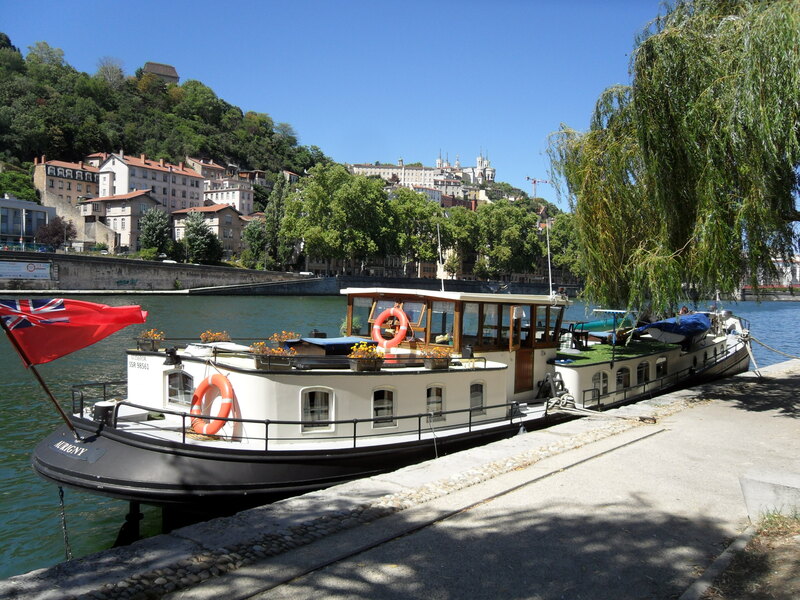 We had not moored in Lyon before, although we had visited friends by motor cycle and I‘d popped in by bus from a mooring further north in 2012. The mooring was okay, but busy with cyclists, pedestrians and the odd ‘clochard’. Peter padlocked us to the bank but we had no problems while we were there. 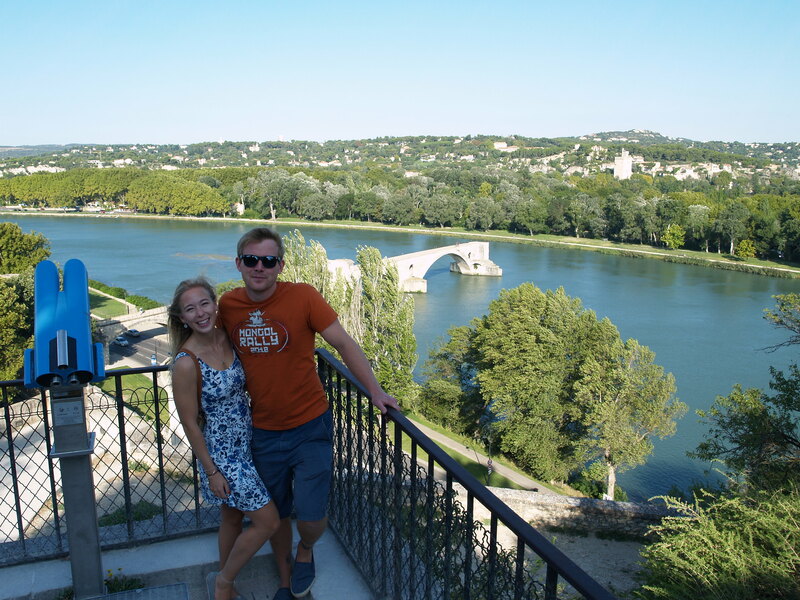 Great views over the Saone and the Rhone. The following morning we slipped across to the water point by the VNF offices and filled up. As we were leaving, a commercial barge passed and we tried to keep him in our sights as he was going our way and we knew the first Rhone lock wasn’t far. We shared the lock with him and were soon in the long cut below. 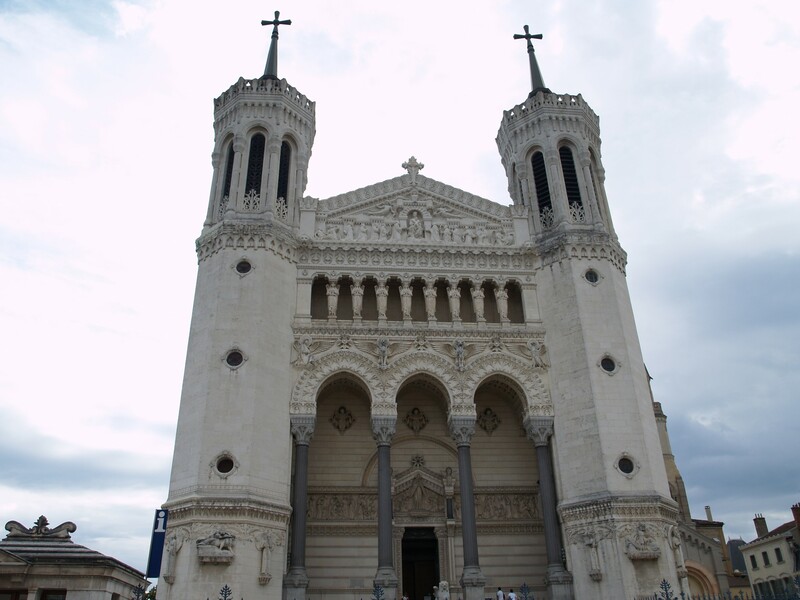 Our aim was to reach Vienne which we did by midday having left Lyon at 8.30am. Our trip was recorded on Peter’s new toy- a Go Pro camera and he put together a speeded up video later that day. We moored on two ‘dolphins’ above the pedestrian bridge on the right bank and stayed six days. Although there were no electrics, our solar panels were doing their job in the sunshine. 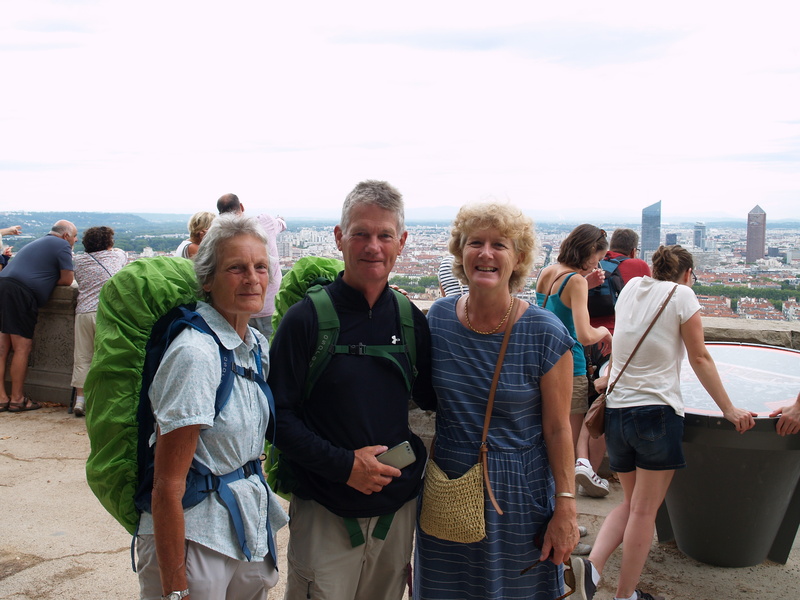 We had stopped in Vienne on our way north in 2012 and liked the town. 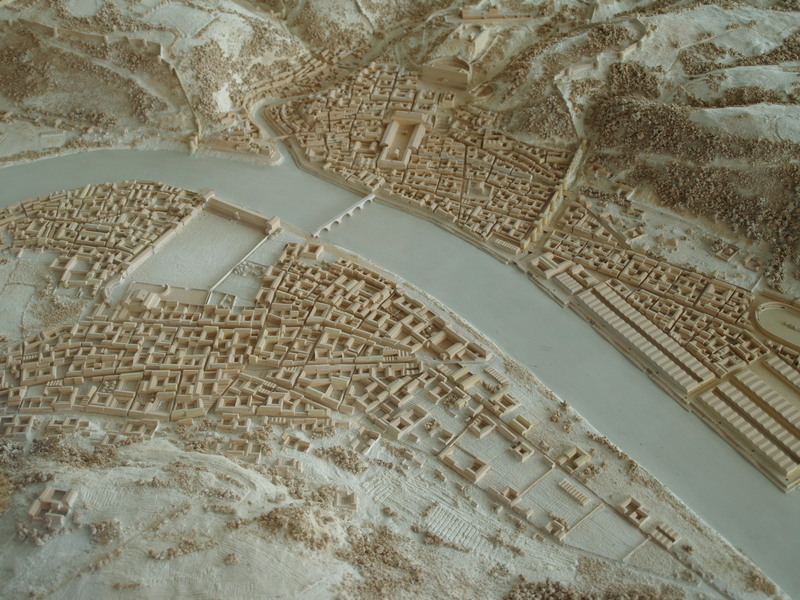 It has a lot of Roman sights to visit and lies nestled between the hills and river on the left bank. The town and river seemed much quieter than before and our mooring had its own gate and pontoon which gave us some privacy. 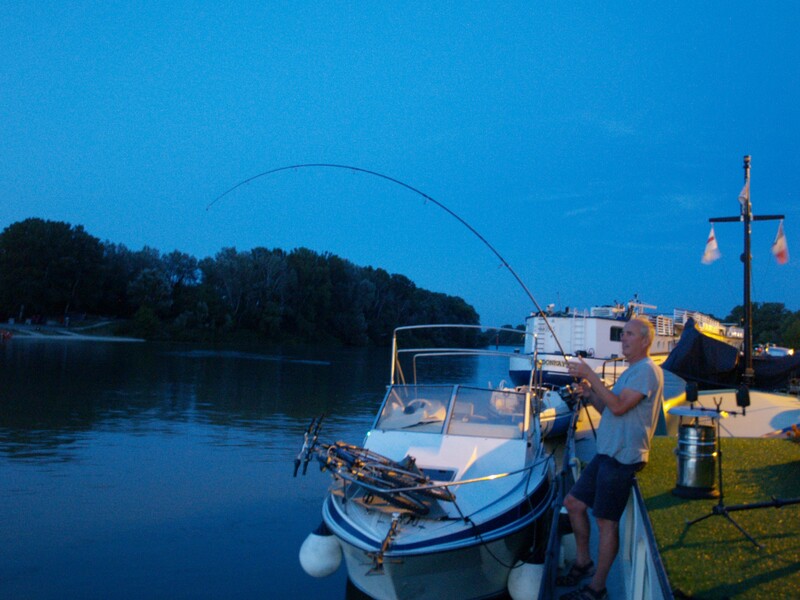 While I re-familiarised myself with St Colombe (the small town on the right bank,) Peter was happily catching a brace of barbell and one of catfish. Gave a nice tug on the line. The next day I walked across the river to take a train back to Villefranche for the car. Vienne was very quiet and there was hardly anyone about. At the station the trains were disrupted and my one wasn’t running. A friendly local explained that it was a Jour Ferie (feast day), so I decided to wait until the following day. We both took the train to Villefranche-sur-Saone the next morning and once again had a longish walk from the station back to the car at Jassans Riottier. 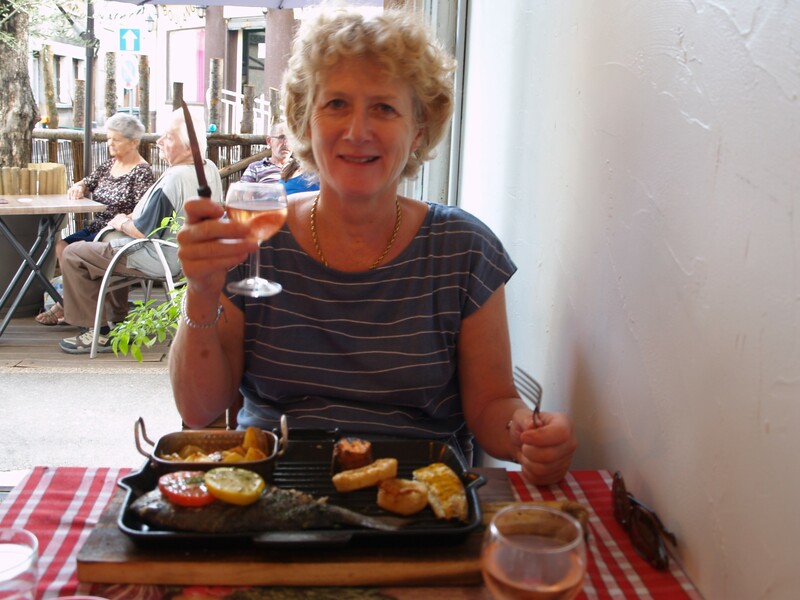 We stopped off in Trevoux and enjoyed a sandwich on the terrace overlooking the river. Well we may as well make use of having a car with us to see some sights. That evening we had a great meal at the nearby Bistro in St Colombes, a short walk from the barge. Realising I’d nicked the bigger beer! Saturday is market day in Vienne and after buying lots of reasonably priced fruit, we walked to the Gallo-Roman museum at St-Romain-en-Gal which was a five minute walk from the barge. 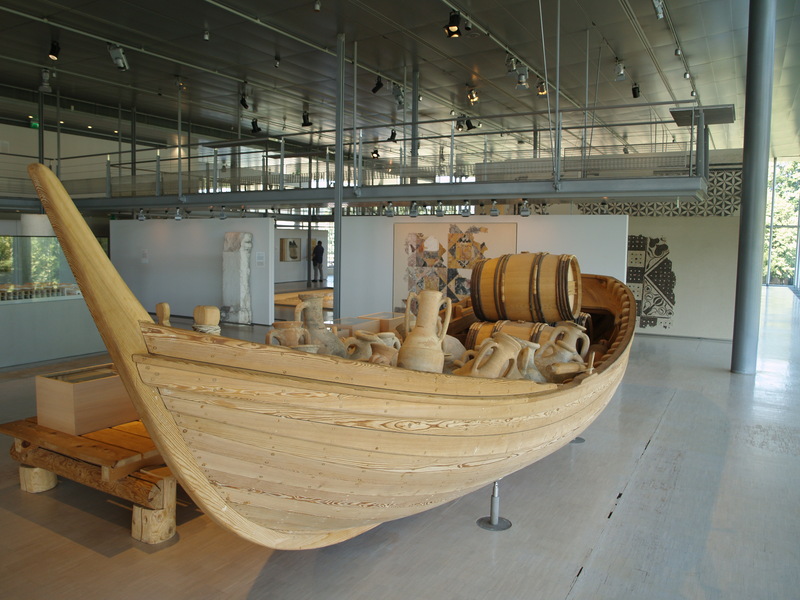 The museum was very interesting and well presented as was the archaeological site outside. We spent several hours there and it was well worth the 6 Euro entry price. 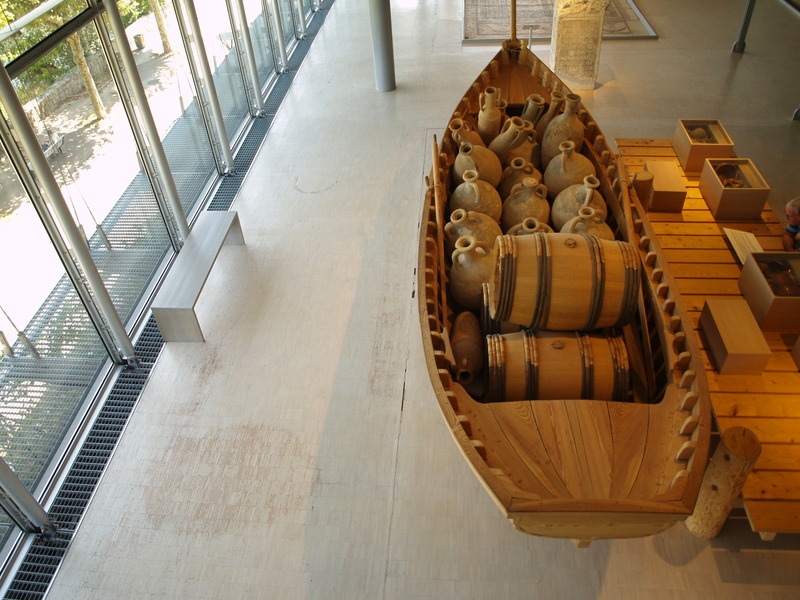 Excellent reproduction based on the remains of a vessel found nearby. 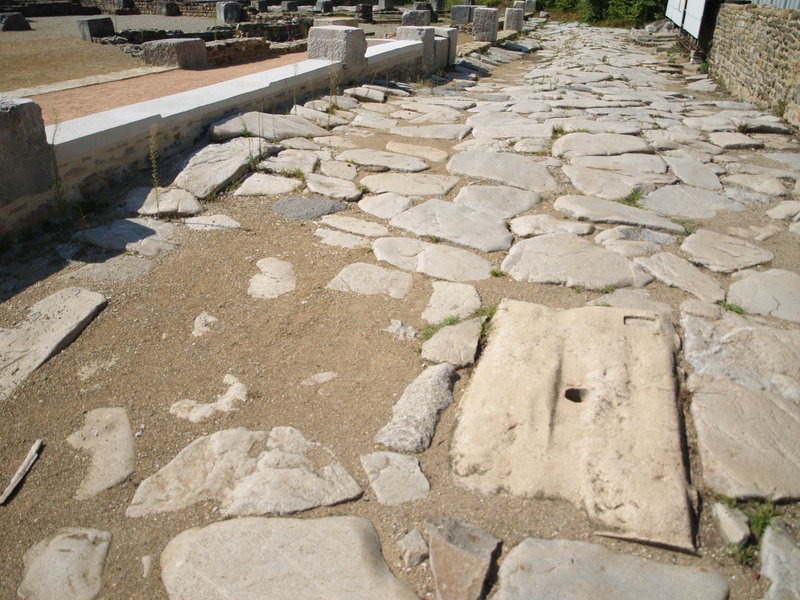 Roman street complete with drainage. As Vienne was, our mooring spot left of the bridge. 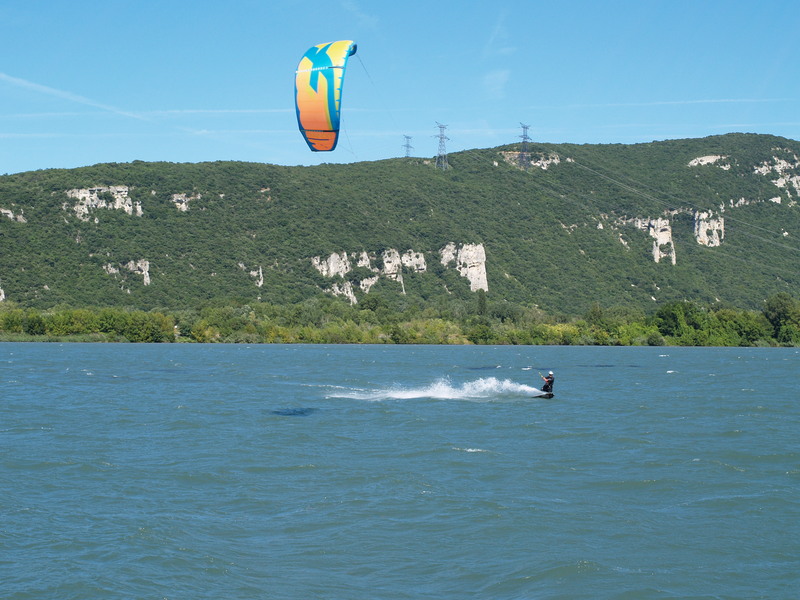 Our stay in Vienne had been fun, but it was time to move on once more. We left on Monday 20th August before 9am and cruised for five hours to Andancette where we had stopped before on our way south. The pontoon was adequate, the town still very quiet and the road bridge across to Andance as pedestrian unfriendly as before. I decided to walk up to the three crosses on the opposite bank as I had done in 2010. This time I wore walking boots and made sure I didn’t miss the poorly signed route up. The Three Crosses and ‘Aurigny’ moored below. The view was as fabulous as I remembered and the old girl as fit as ever ; ) I even went a bit higher before returning to the barge. 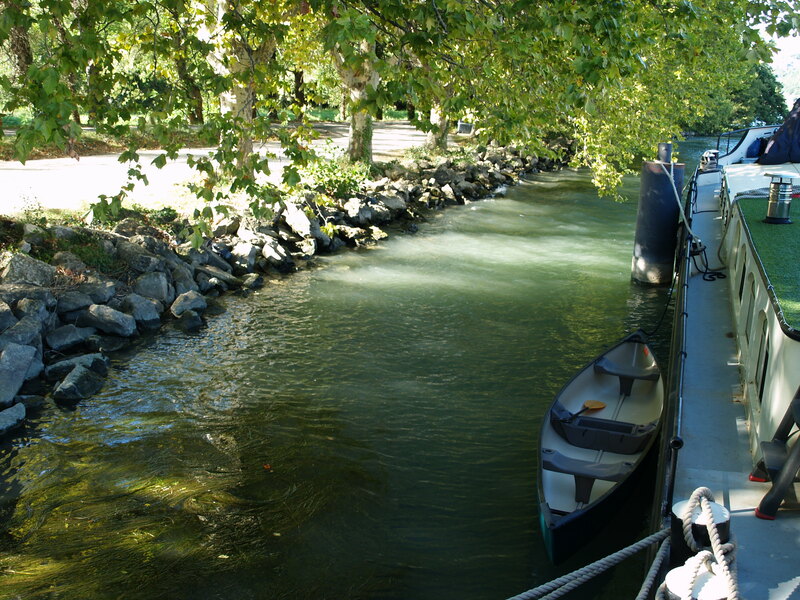 We moved on after a couple of days and were pleased to find a mooring at Tournon. The port was undergoing refurbishment and after mooring on the new sturdy pontoon, Peter chatted to the chap who ran a small trip boat. He said we would be fine there for a couple of days but that there were no electrics or water. No matter… we had been unable to stop there previously and it is unlikely we will be permitted to stop there in the future so we ‘seized the day’. Several other barges and boats joined us in the port with no problems. 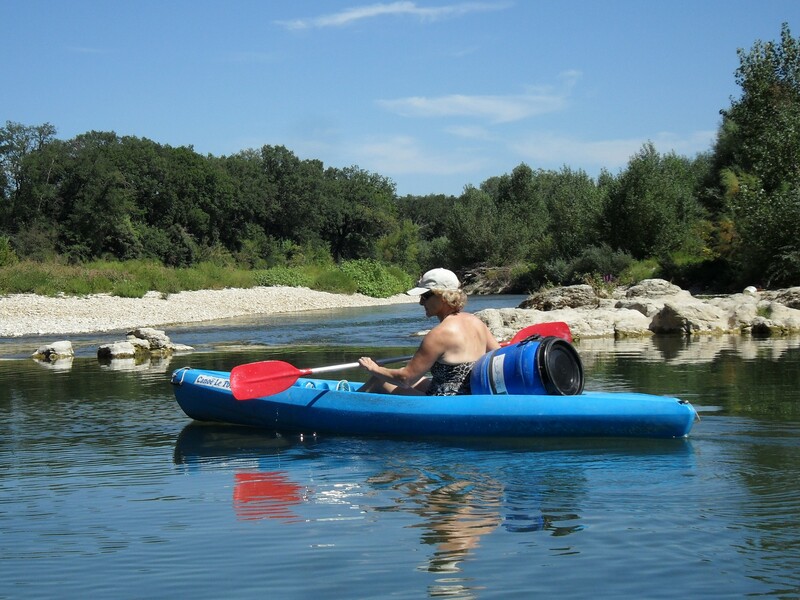 On our way north in 2012 we had stopped briefly on the opposite bank at Tain l’Hermitage hoping to buy some wine. As we were mooring up, Adam had phoned us with the excellent news that he had achieved a First Class Honours degree in Computing and Maths. This time, we had just settled down to enjoy a cold beer when we discovered that he and his friends Danny and Ollie had reached the finishing line on the Mongol Rally. Quite an achievement in our little Micra car that had already done us excellent service during our barging travels. It had ‘done’ its 100, 000 miles while rallying and 10,000 miles on the rally itself. Cause for celebration. 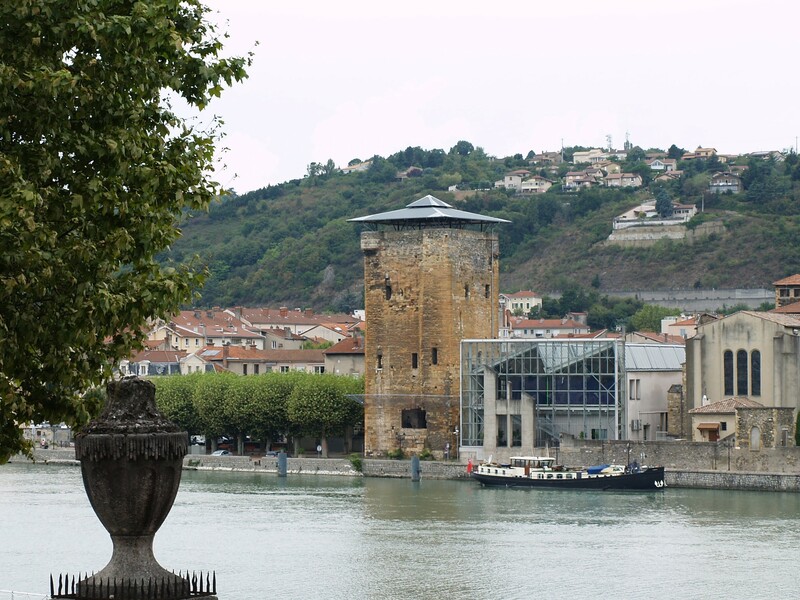 Tournon is a nice riverside town with lots of bars and restaurants. The Cotes du Rhone vineyards and caves abound. 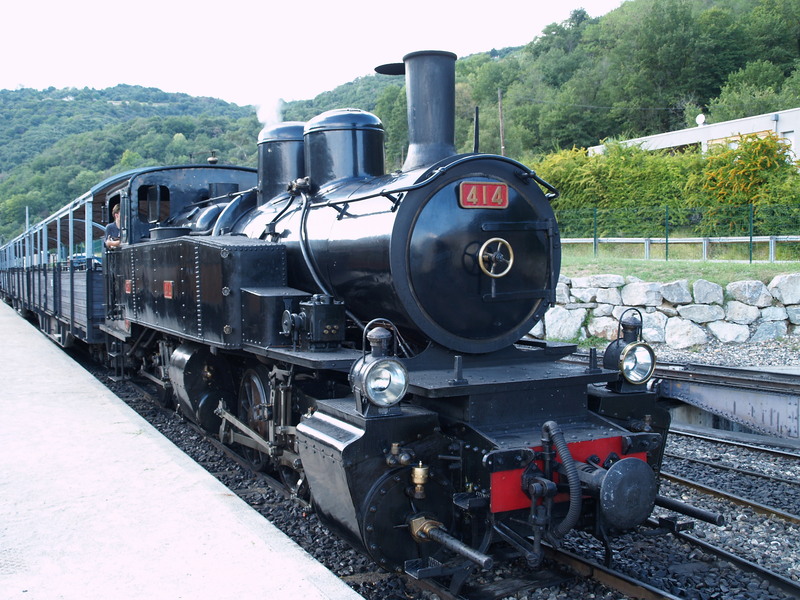 We took the train back to Vienne the next morning and returned to Tournon via the ticket office of the ‘Train des Ardeche’ which is a steam train that goes up into the hills. 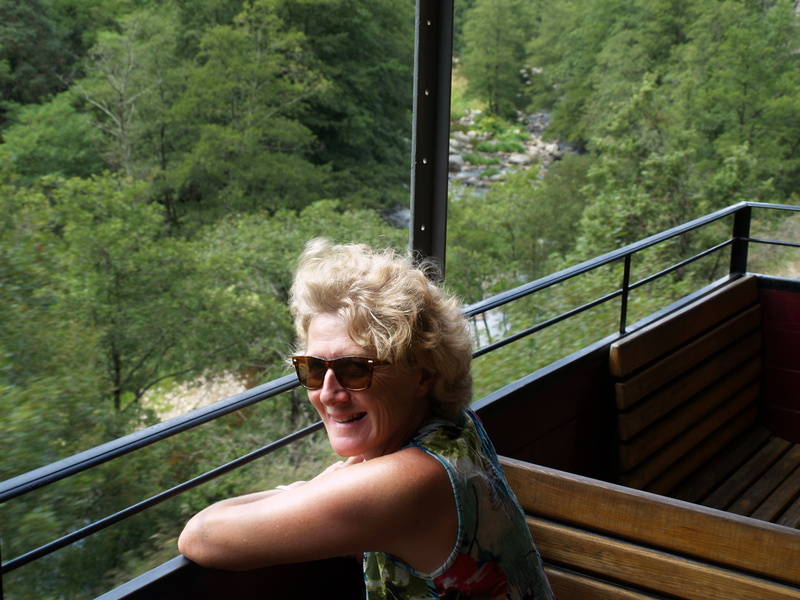 Our train left at 3.15 so we returned to the barge for lunch before driving back up to the station. It was a very pleasant excursion, not least because the temperature was cooler uphill. Lovely scenic route alongside a river. Not wishing to outstay our welcome we left the next day heading for Le Pouzin (another quay we had used in 2012.) En route, we saw a huge fire raging ahead of us near Valence. 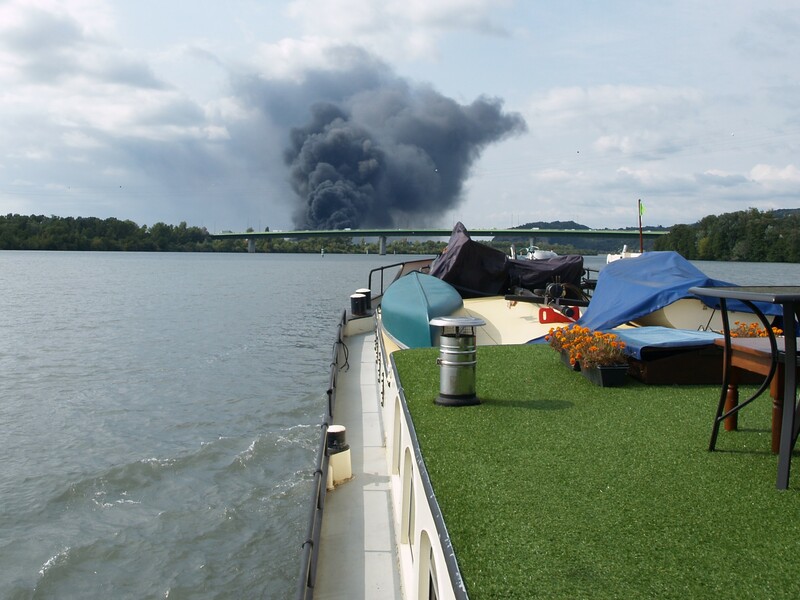 Apparently a tyre factory had caught fire and black smoke billowed into the sky. The fire fighting was not helped by the fairly strong wind. Our destination was taken by a hotel barge and on inspection later we discovered that it was now only available for ‘Authorised Passenger Boats’. Having told Sue and Allan (‘Whisper’) about the ‘great quay’ at pk 133, we looked for an alternative and found one a kilometre further downstream. They joined us there from Valence later the next day, rafting alongside. 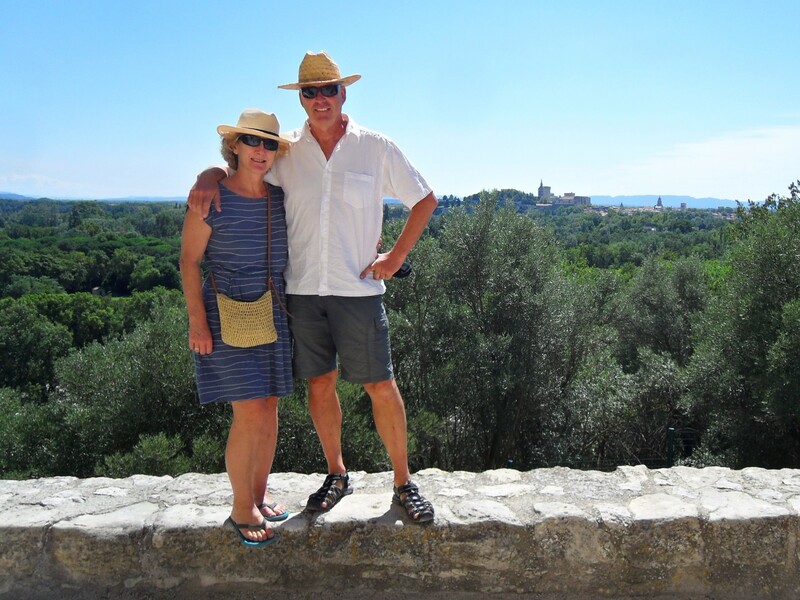 We left together on Sunday 26th August, cruising towards the old town of Viviers. ‘Whisper’ secured a mooring in the port there, but we knew that ‘Aurigny’ was too big. Fortunately, a couple of km downstream there were two dolphins 5m from the bank which were vacant and suitable. 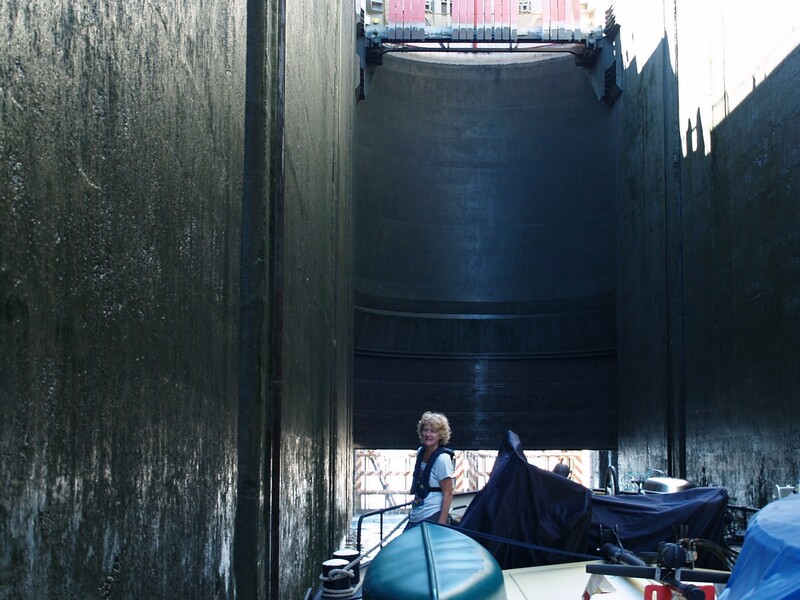 Sharing a huge Rhone lock. Perfect for these guys though. After mooring up to a ripple of applause from some picnickers, I paddled to the bank in the canoe and walked back to the town. It was rather further than I had thought, so I headed back having missed Sue and Allan who had gone exploring. However, our mooring was very pretty and quiet. Good solid mooring but no shore access. 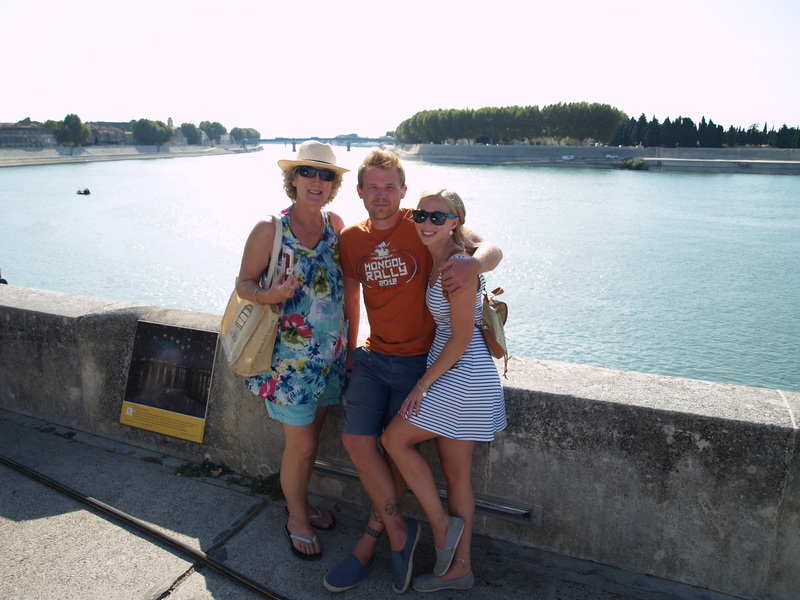 With Adam and Felicity arriving in a few days time, we set off the next morning for a long 8+ hour cruise to Avignon. 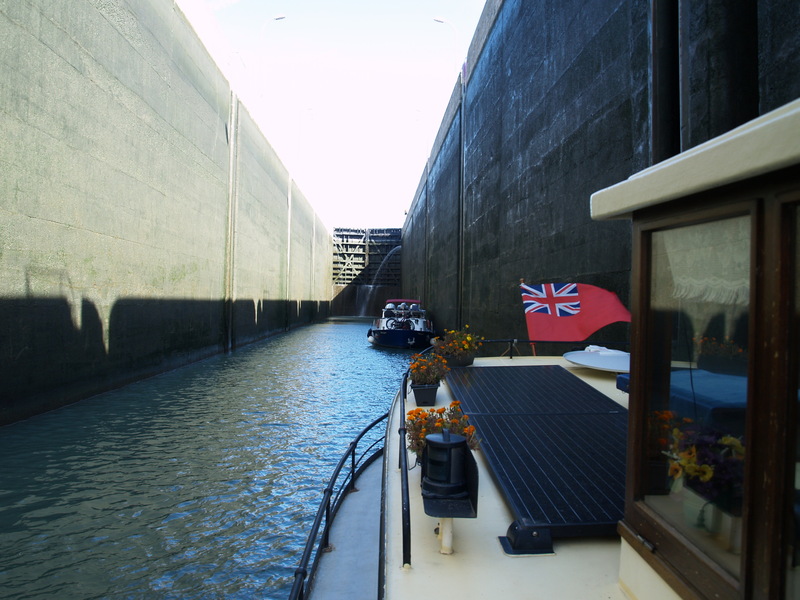 The mighty Bollene Lock is always an experience and despite a couple of delays at locks, we had moored up in our pre-booked spot at Avignon by 4.15pm. As on our previous visit in 2010, we decided to pay for a week, which works out cheaper than the daily rate, although still not that cheap at 180 Euro. 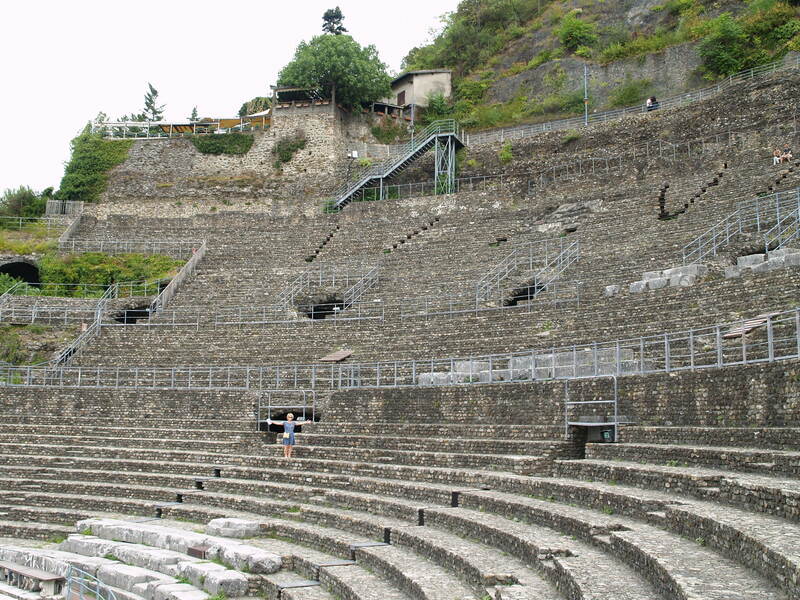 Our next day was a long one, as we returned to Tournon for the car. In fact Tournon station is now closed so we used the one at Tain l’Hermitage where we had left the car a few days before. On the way back we took the scenic route and stopped off in Montelimar so I could buy some of the famous Nougat. 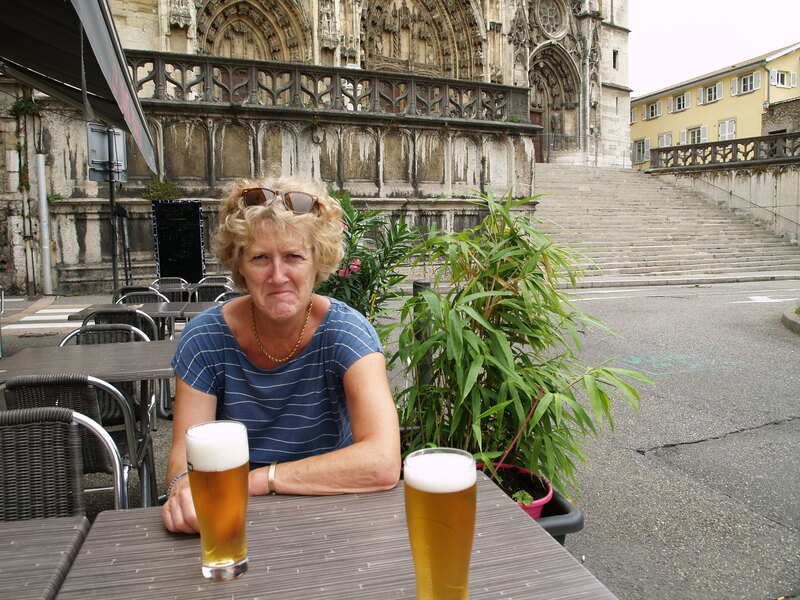 Next stop was Viviers, where we had a welcome beer before I left Peter and walked up into the old town. As we were driving away, we saw Sue and Allan in their car. They had just returned from shopping and so while the chaps resumed their boules competition, Sue and I relaxed onboard ‘Whisper’. 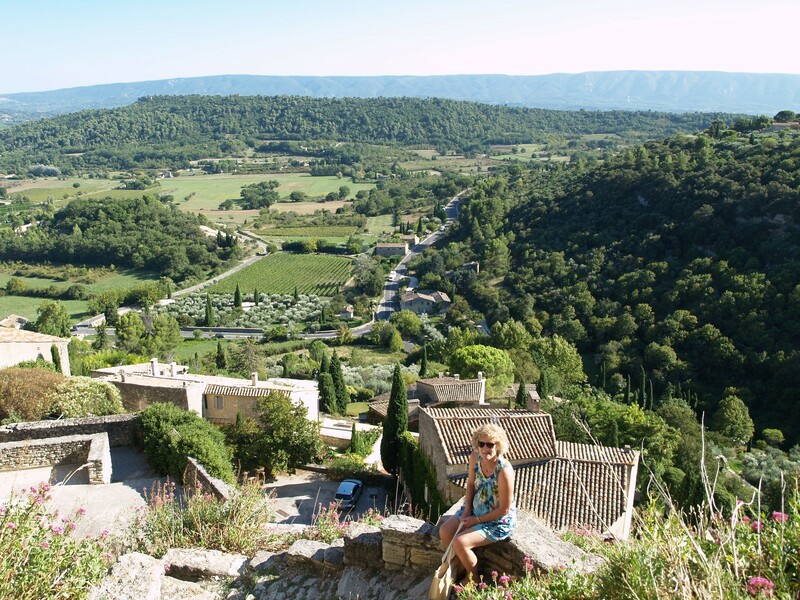 With over sixty kilometres to drive back to Avignon in the rush hour, we said ‘Au Revoir’ and headed off. The petrol tank was on ‘empty’ as we reached the outskirts of Avignon where there were several closures due to the laying of a new tramway. Having circumnavigated the town walls, we took a wrong turn which took us through a gate and into the town centre. While it is pleasant to walk around the narrow streets, driving is not to be recommended, as one way streets totally confuse the sat nav. Even our new one – ‘James’ struggled to help us find a way out. I was mightily relieved to finally reach the mooring, although naturally Peter said there was still plenty in the tank! 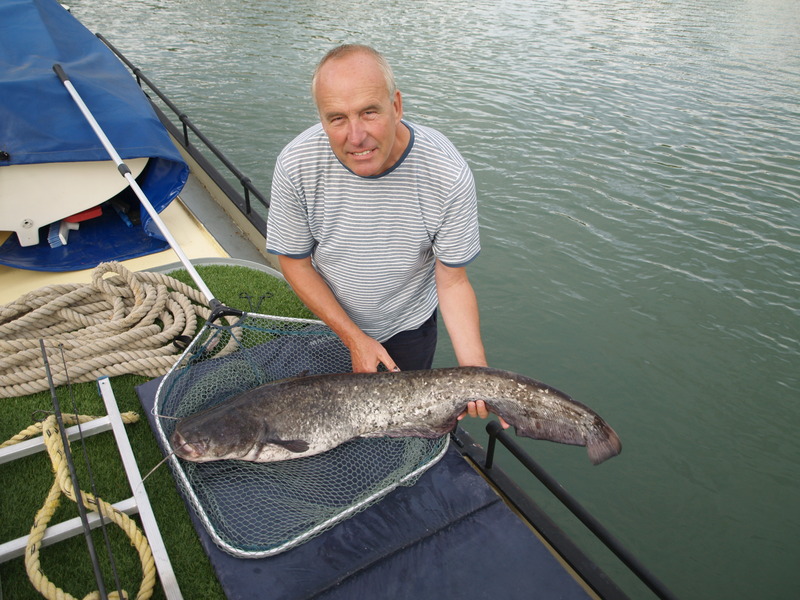 That evening Peter caught a barbell and then a massive catfish which took over an hour to land and then had to be lifted back into the river using towels. 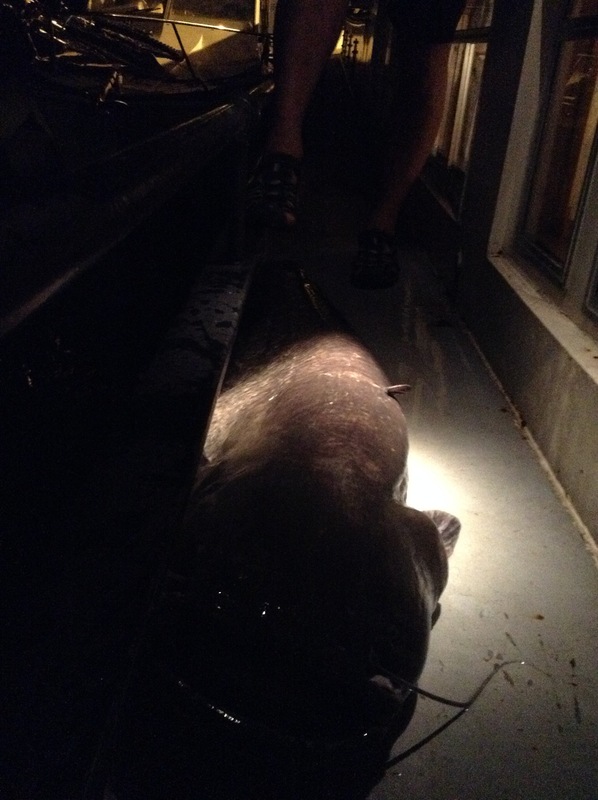 About an hour and twenty minutes later this 122lb catfish ! The next day after a shopping and fuel expedition, I bought a combined ticket for the Pope’s Palace and Pont de St Benezet, neither of which I had visited last time. My over sixties concessionary ticket made it very good value at 11,50 Euro. In the Palace they provide a bespoke Ipad which as well as explaining things allows you to see the various halls as they might have been back in the day. 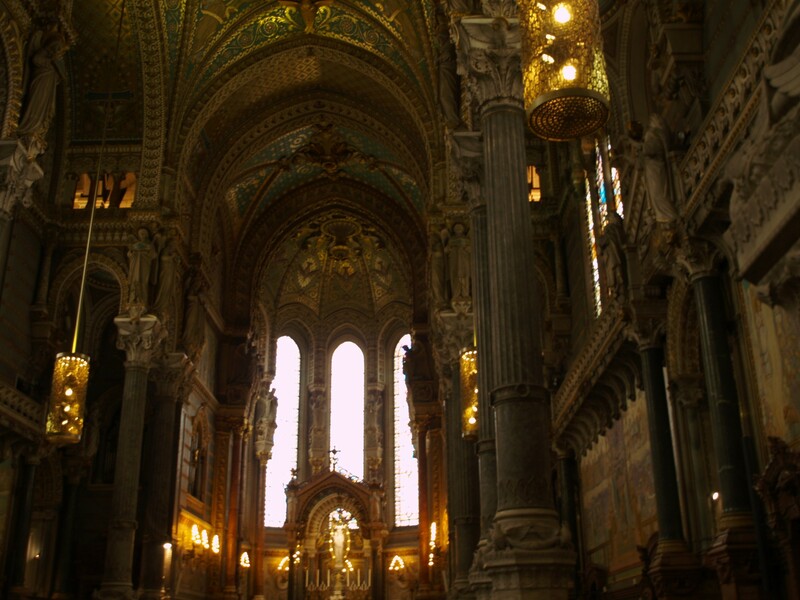 This did bring the place to life and showed how well those Popes looked after themselves. The next day, I enjoyed an early morning walk up the ramparts and into the town before it became too hot and practically had the place to myself. With Adam and Felicity arriving the following evening, much of the rest of the day was spent preparing for their visit. 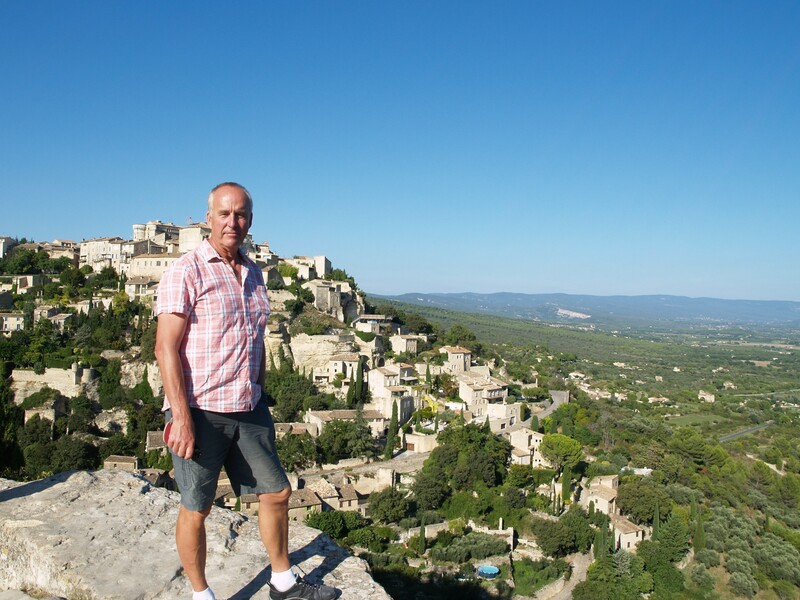 With their arrival at 9pm the following evening, we decided to drive to Marseilles airport via the pretty hillside town of Gordes, a very picturesque spot with lovely panoramic views all around. With more time to kill we had a meal in Berres and were just a few minutes from the airport when Adam texted to say they were outside waiting. The very pretty hilltop town of Gordes. Looking back from the town. Sadly the drive back on the motorway was delayed owing to heavy traffic and as we approached Avignon the annual summer firework display was just reaching its climax. 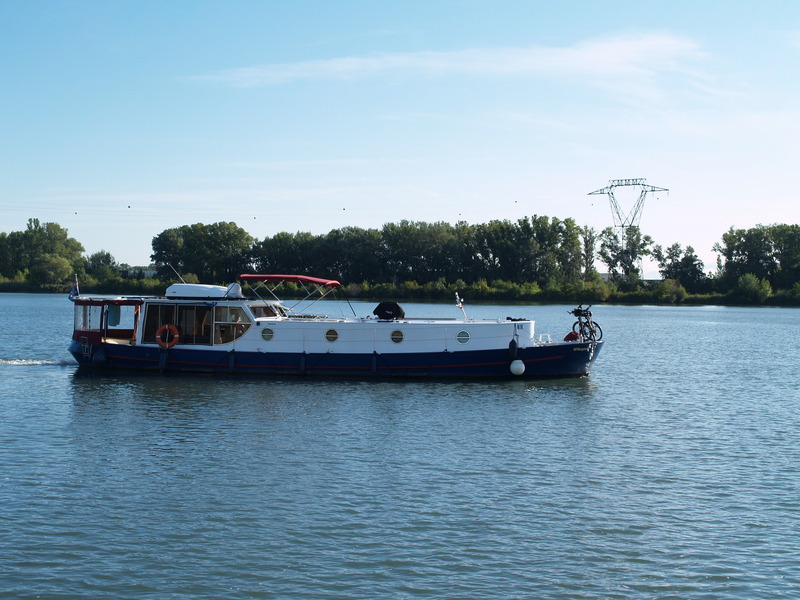 As it was on the river banks the road to our mooring in the port was temporarily closed and after dropping us at a nearby gate, Peter had to brave the roads within the ramparts once again before the road was finally opened. 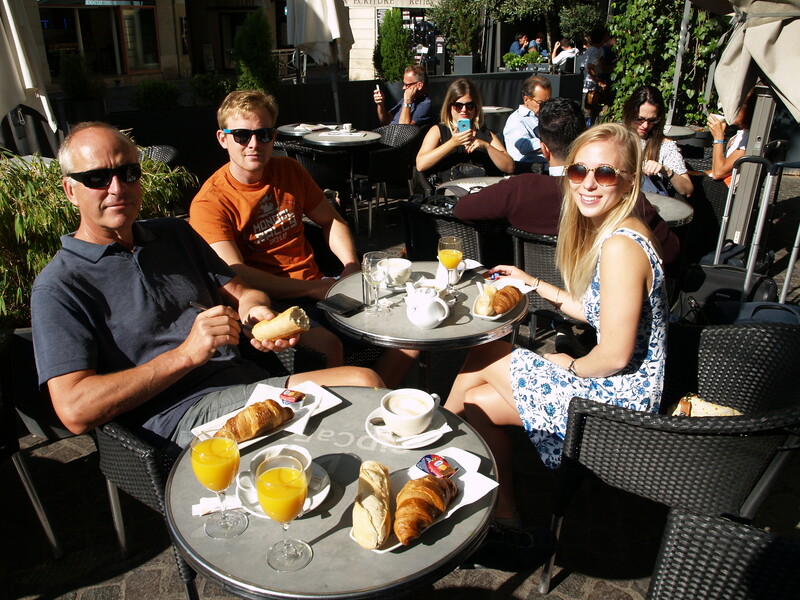 We enjoyed just under a week together and were treated to a tasty ‘Petit Dejeuner’ in the centre the next morning. 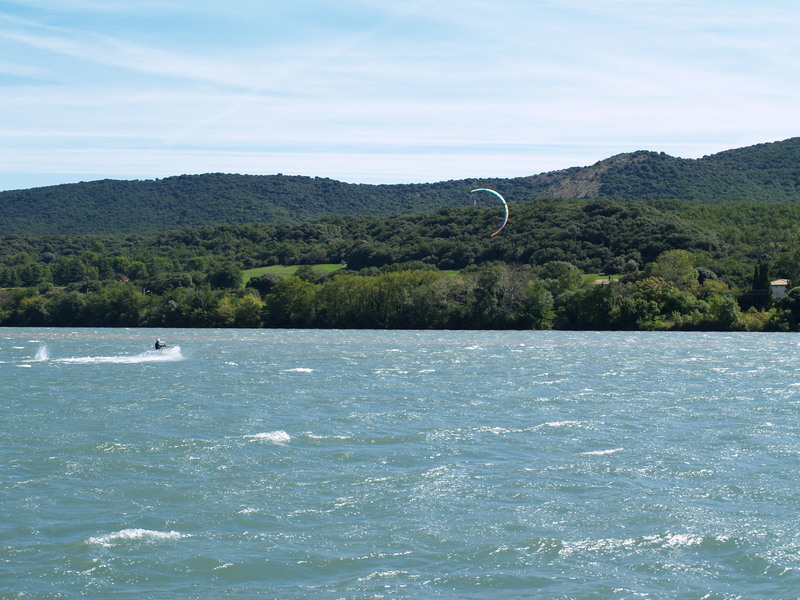 Adam and Felicity explored the town, the ‘Pont’ and the opposite bank on foot and by bicycle despite the strengthening wind. 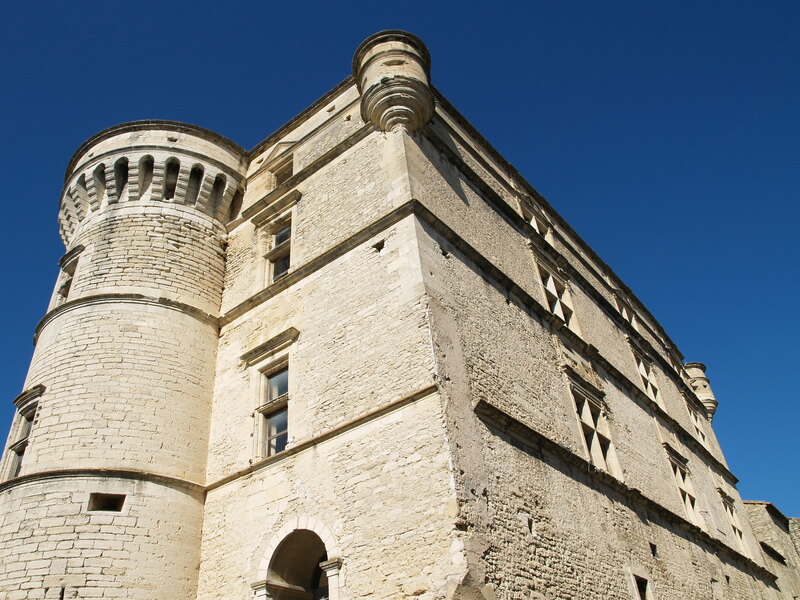 We drove across the river to check out the mooring at Aramon and then back to Villeneuve-lez-Avignon to visit the fort. The view across to Avignon is very pretty and a cold beer in the old town centre went down well before returning to the barge. …followed by breakfast in town. Looking back from the castle at Villeneuve-lez-Avignon. 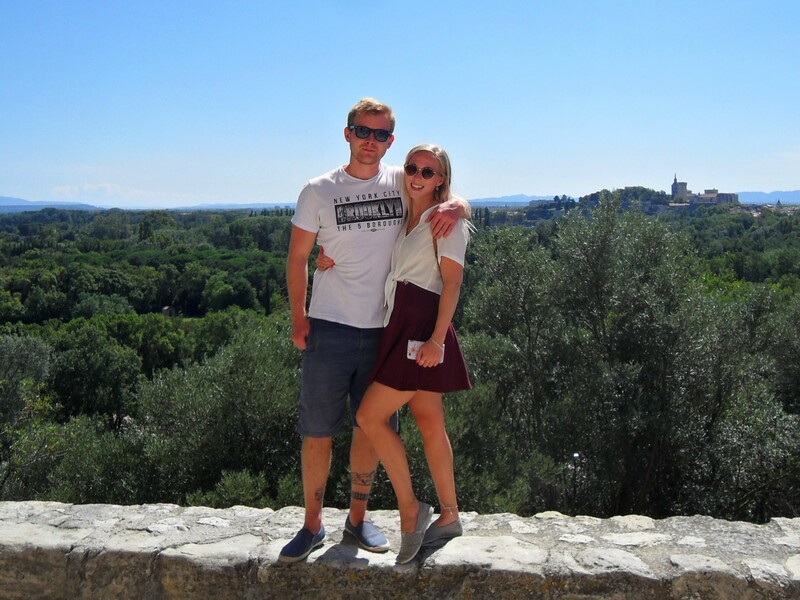 Our week in Avignon being up, we set off in beautiful sunshine for Aramon the next morning. It was only 14km away, so it didn’t take long. The river is very wide here and deep enough near the pontoon to enjoy swimming and somersaulting. With temperatures in the 30s it was a good way to cool down. 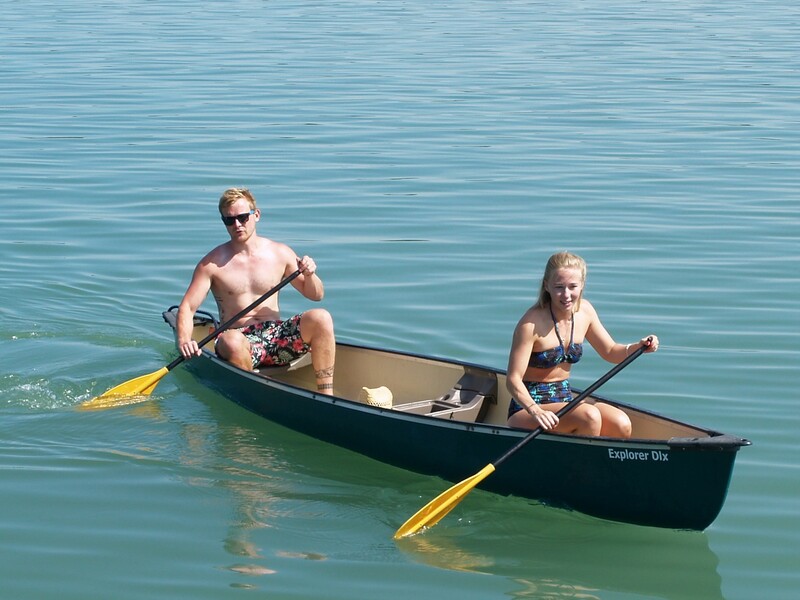 Our canoe also got some use, although swimming off it proved a bit tricky. A slightly flooded canoe after a swim! 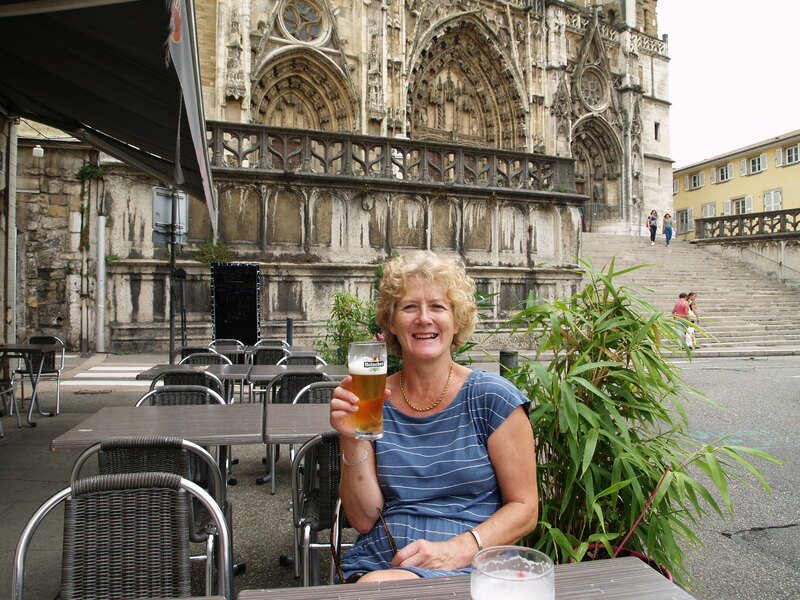 Having retrieved the car from Avignon, we were able to drive to Arles on their final day and enjoy a drink near the Roman Amphitheatre. All too soon it was time for them to leave and catch the train back to Marseilles Airport, leaving us with happy memories of their stay. 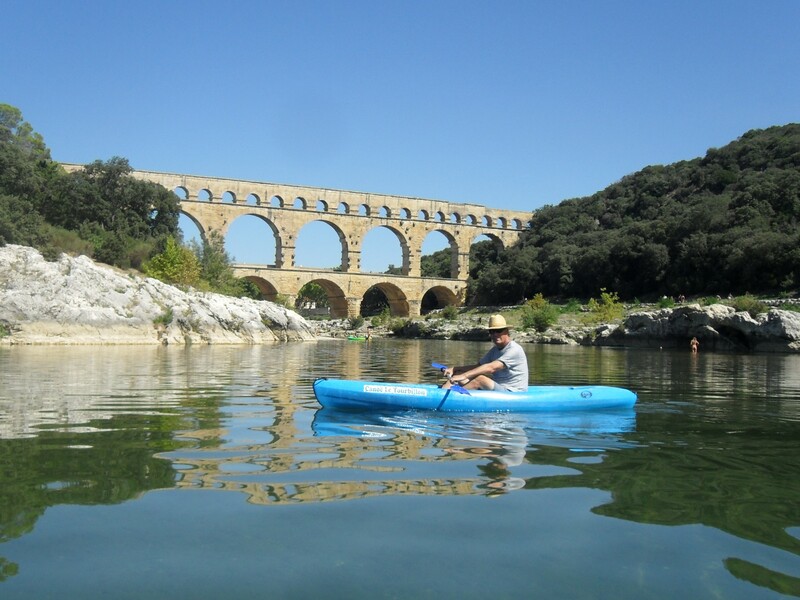 As we were in no hurry to continue our journey south, we booked in for a week and took the opportunity to kayak one afternoon on the River Gardon, which took us underneath the stunning Roman Pont du Gard. Cracking day for a paddle. 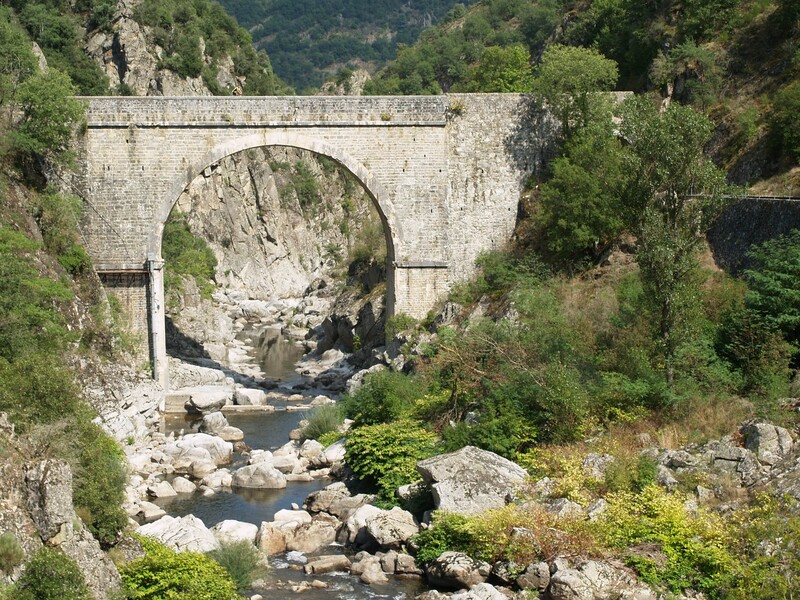 2000 years old…The Aqueduct ! 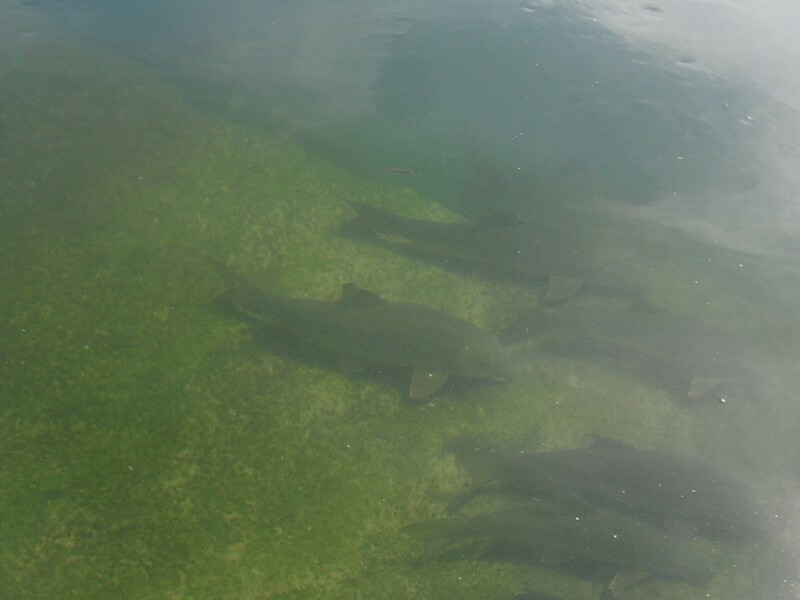 The river is teeming with big barbel, trout and carp. 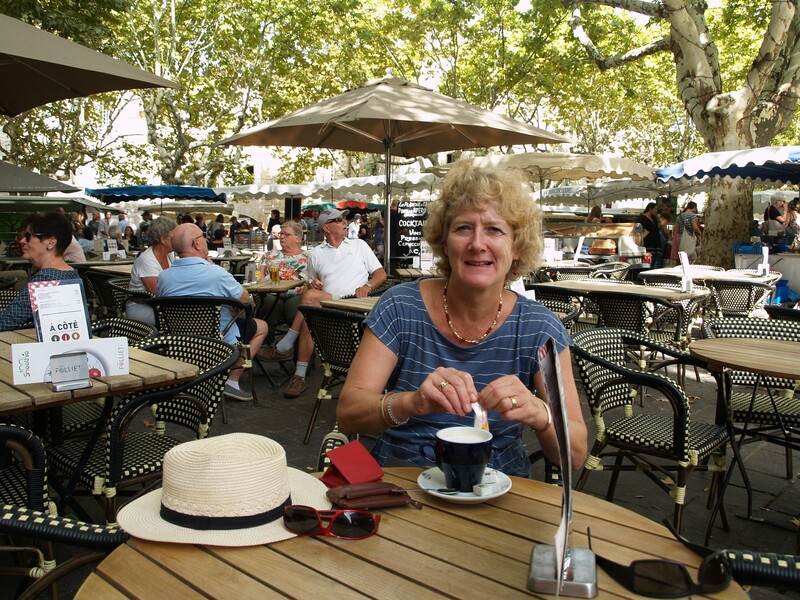 Charlie and Liz came for lunch one day and we met them in Uzes the next, soaking up the very French atmosphere at the market in the Place des Herbes as we dined. 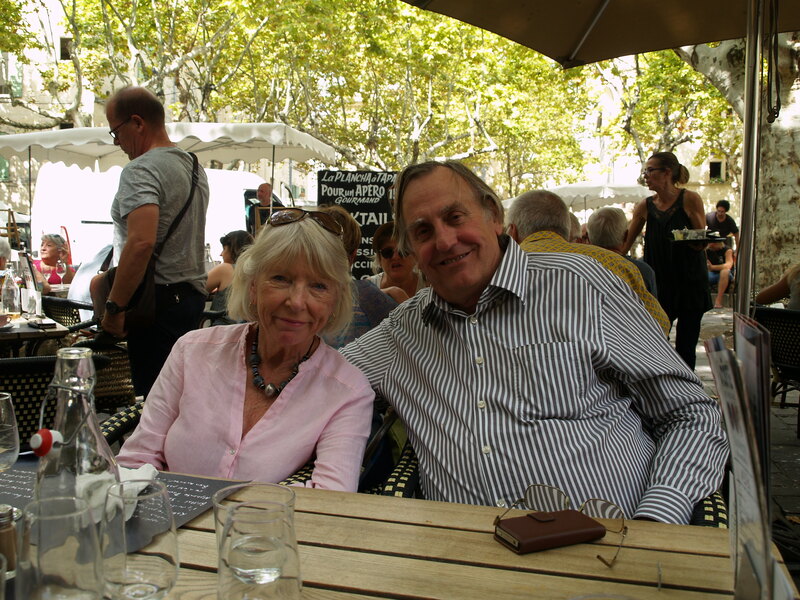 Then a lovely lunch in Uzes with Charles and Liz. 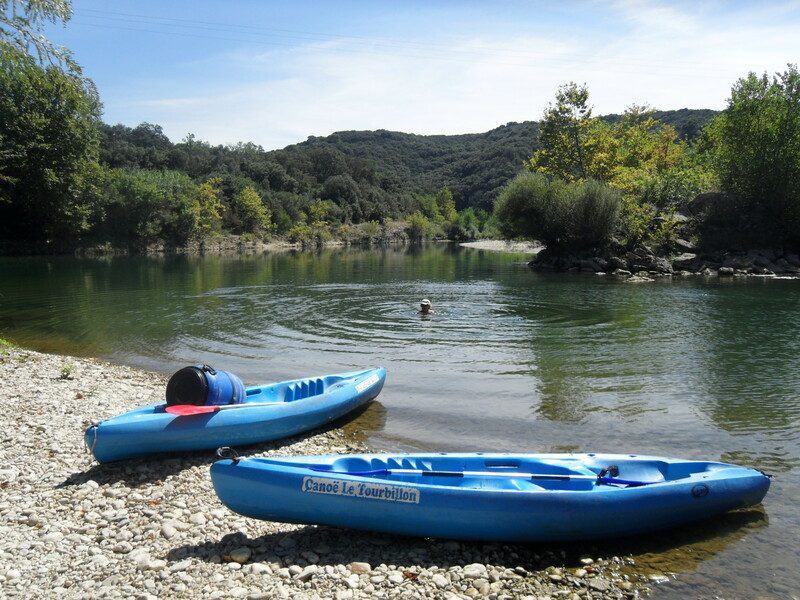 With Jean and Paul visiting a few days later, we decided to grasp the nettle and pay for another week at the very pleasant Aramon Halte Fluviale, before finally leaving the Rhone. Superb moorings and old town at Aramon.